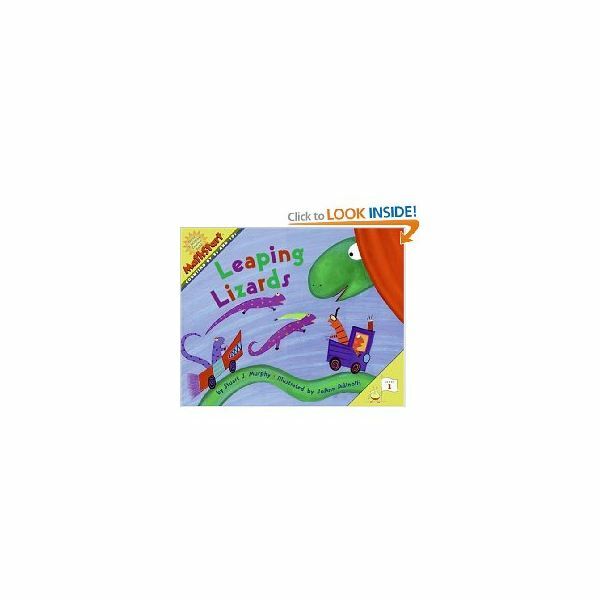 Most students find story problems intimidating.With the simple story supplied by Leaping Lizards, students can develop story problems of their own focusing on addition, subtraction, division and multiplication. Summary: Fifty leaping lizards are needed for the show.Lizards join the show by fives. Note: These activities are in addition to what is suggested in the back of the book. 2. Using the scenario that each set of lizards need an act besides leaping. Each act will have five lizards in it. The focus is addition. Have the students establish how many sets will there be, then they will develop a master key for what each group will be doing. Have them write a simple story problem, i.e. If five lizards of the leaping lizard show rode bikes and five more skated, how many lizards have acts? Continue until each group of five has an act. 3. Change the focus to subtraction. It’s time for the leaping lizards to head home. The skating lizards hear their mom calling. It’s time to leave. Now that the skating lizards are gone, how many lizards are left? Continue each until each group is gone. 4. Division and multiplication story problems can also be developed from this story. Example: Costumes have arrived for the leaping lizard show. There are five colors. Have the students pick the color and write a sentence detailing how many wore each color, i.e. Ten leaping lizards wore the bright red costumes. The leaping lizards need costumes. If only two lizards are going to wear the same color, how many different colors need to be ordered? Note: Students may find it useful to have note cards with five objects on each to represent the leaping lizards.